There have been a series of hold-ups with Intel's new Ivy Bridge processor line, but according to CPU World the wait is almost over; some of the new mobile and desktop quad-core chips will be launched before the end of April. 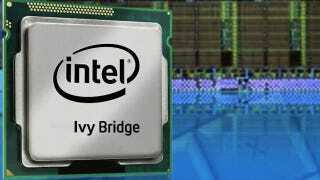 "Ivy Bridge processors will be announced in the 4th week of April, between April 22 and April 28. The announcement will include only quad-core models: mobile Core i7 and Core i7 Extreme families, desktop Core i7, Core i5-3570K, i5-3570T, i5-3550, i5-3550S, i5-3450 and i5-3450S. The announced chips will be available for sale on April 29, and the reviews and benchmarks should be published on the same day. Specifications and prices of these processors are provided below:"
Those are all quad-core processors, with clock speeds ranging from 2.5 GHz to 3.5 GHz, which is great news for the desk-bound and those who use high-performance laptops.